Adults are reddish brown (juveniles gray), with a white belly, white feet, membranous ears, and bicolored tail (usually not sharply bicolored); adult total length 145 to 205 mm, tail 62 to 97 mm (usually shorter than head and body), hind foot 18 to 24 mm, ear 13 to 19 mm; 16 to 29 g in the northeastern U.S.; 3 pairs of mammae (Paradiso 1960, Godin 1977, Hall 1981). Often difficult to distinguish from P. maniculatus. In New England, differs from P. maniculatus by having coarser and redder pelage, a more well-defined mid-dorsal stripe, a tail that is less distinctly white on the ventral surface and that seldom is as long as the head and body, and a broader rostrum (Godin 1977). See Hoffmeister (1986) for differences from Peromyscus species in the southwestern U.S.
Riparian woodland, dendritic distribution, uses thickets, shrubs. Nest 7 inches in diameter of plant materials. Somewhat omnivorous. Seeds, fruits and insects are dominant items, with order of importance varying between season and ranges. Probably restricted to warmer months with peaks in March to April and September to October, in midsummer heat reporduction may slow down. Godin, Alfred J., and Harry Vanderweide. 1983. Wild mammals of New England. Yarmouth, Me: DeLorme Pub. Co.
Paradiso, J.L. 1960. A new white-footed mouse (Peromyscus leucopus) from southeastern Virginia. Proceedings of the Biological Society of Washington 73:21-23. Bendell, J.F. 1961. 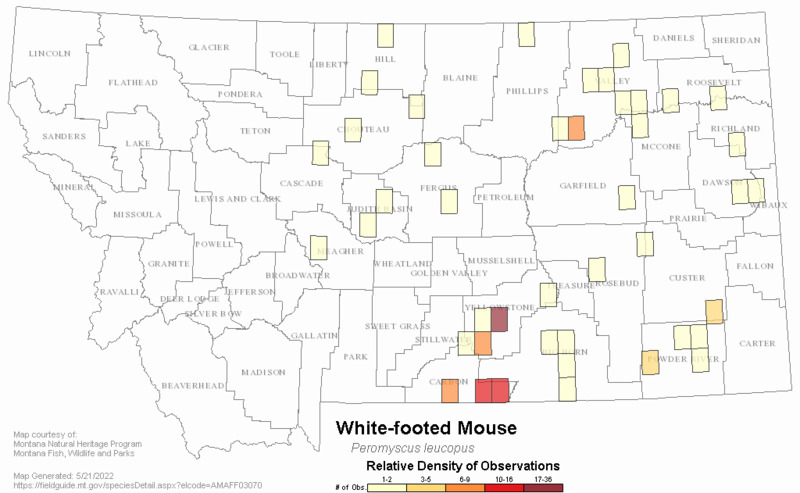 Some factors affecting the habitat selection of the white-footed mouse. Can. Field-Nat. 75(4):244-255. Blem, L.B., and C.R. Blem. 1975. 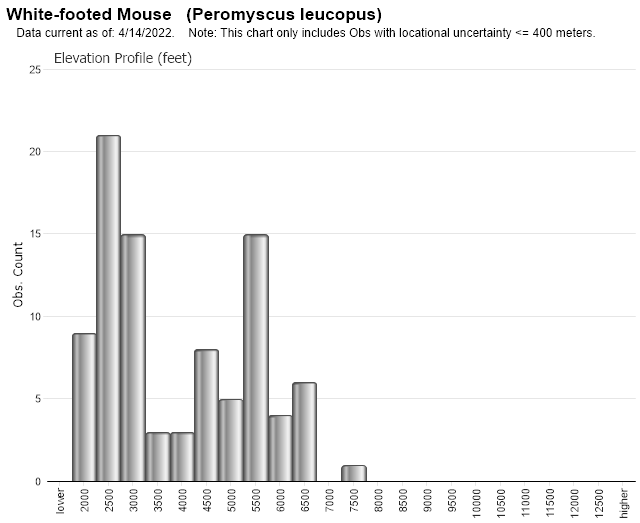 The effect of flooding onlength of residency in the white-footed mouse, Peromyscus leucopus. Am. Midl. Nat. 94(1):232-236. Cummings, J.R. and S.H. Vessey. 1994. 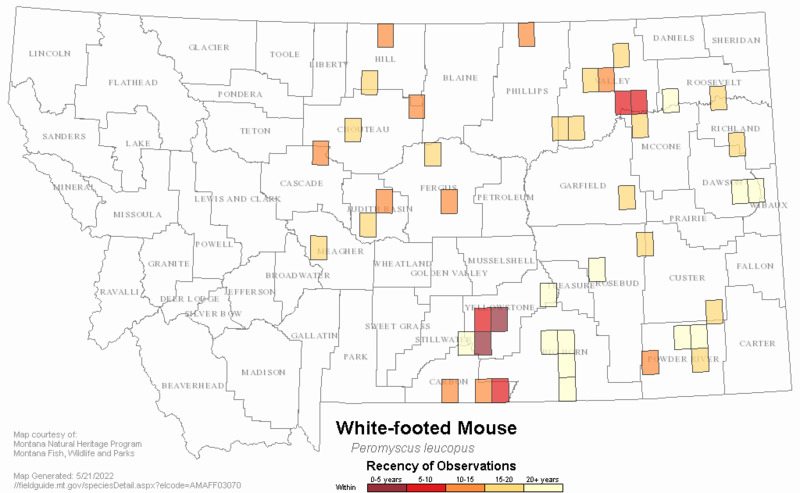 Agricultural influences on movements of white-footed mice (Peromyscus leucopus). American Midland Naturalist 132:209-218. Kaufman, D.W., M.E. Peak, G.A. Kaufman. 1985. Peromyscus leucopus in riparian woodlands: use of trees and shrubs. J. Mammal. 66(1)139-143. Kaufman, D.W., S.K. Peterson, R. Fristik and G.A. Kaufman. 1983. Effect of microhabitat features on habitat use by Peromyscus leucopus. Amer. Midl. Nat. 110(1): 177-185. Kaufman, G.A., D.W. Kaufman and E.J. Finck. 1988. Influence of fire and topography on habitat selection by Peromyscus maniculatus and Reithrodontomys megalotis in ungrazed tallgrass prairie. Journal of Mammalogy 69:342-352. Krohne, D.T. and R. Baccus. 1985. Genetic and ecological structure of a population of Peromyscus leucopus. Journal of Mammalogy. 66:529-537. Lackey, J.A., D.G. Huckaby, and B.G. Ormiston. 1985. Peromyscus leucopus. Mammalian Species 247:1-10. Montana Dept. of State Lands. U.S. Office of Surface Mining., 1985, Draft Environmental Impact Statement. Consolidation Coal Company. CX Ranch Mine, Big Horn County, Montana. Web Search Engines for Articles on "White-footed Mouse"